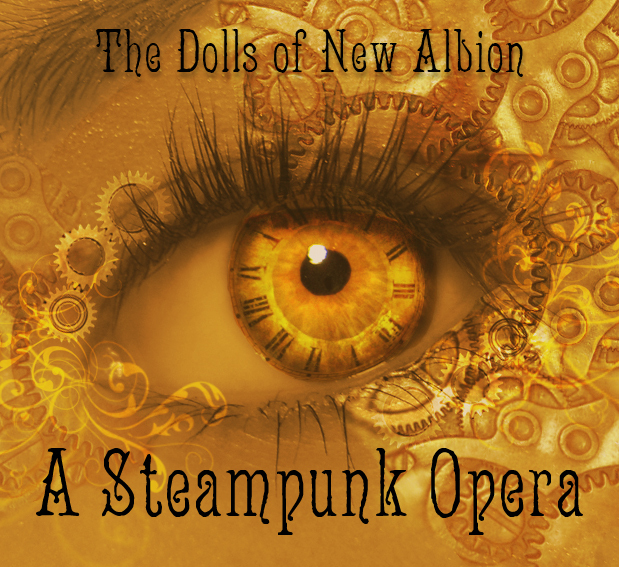 Welcome everyone to the grand premiere of the entire album The Dolls Of New Albion, A Steampunk Opera. This 90 minute, 4 Act slightly demented musical story features the immense vocal talents of Lauren Osborn, Jason Broderick and Kayleigh McKnight. Written and produced by Paul Shapera. Officially out today you can purchase the entire double album for only 12 little measly US dollars. If you live in England or Europe this is like money you lose in your couch and if you live in a Scandinavian country, this isn’t even money. It costs more there to feed a flea. But wait! There’s more! Not only does the full download come with the complete lyrics, should you want them compiled in one easy spot then take note, if you look near the top of the page you’ll see a new tab called Libretto. It has all the lyrics so you can read them, copy and paste them, or use them to make dirty rhymes by substituting naughty nouns and verbs at just the right places. It slices! It dices! How many times have you had to put up with embarrassing spills and odors? Well no longer! It’s a @#$#^## download! It won’t mess up your kitchen and is great to cook while listening to! I’d like to lastly thank Mark Swetz and MProductions for their invaluable assistance. If you have already purchased the 1st Act or the Random Tracks sampler before May 8th, 2012 and would like a half off discount, please email me at paulms@gmail.com with your name (which i have on file) and i will send you a special download code. Also, thank you, each and every one of you who not only buys it, but actually likes the damn thing. I cannot put into words what that means to me. Yes folks, it is done. I have nothing else of consequence to say at this time. I’m exhausted and fleeing to Belgrade for a few days and not listening to it so i can come back and make sure it’s all good. I will continue to post random inanity from there. Talk to you all on Thursday. And by talk, i mean anything from insightful to perty little pictures of whatever takes my fancy. In the meantime we come to the enrapturing Lauren Osborn and a song from the 4th Act. I had discussed this song in length quite a while back during my discussions abut the Priscilla character and this is what emerged. The entire completed album will be available shortly, there’s just a few more steps in between here and there. Okay, so now that you’ve got a Fiona Apple/DD thing in your head, let’s take that idea and bring it into the realm of psychotic breakdown. I mean seriously, that and some other songs of theirs are kind of insane. And once again, that’s a good thing. They have a dark edge to them that is achieved at the musical level, not simply by singing dark lyrics over lurking music. The music itself twists off the cabaret ledge, sometimes hanging on by its fingernails before managing to crawl back up again. Which i like. They’ve got something going on. They play in Los Angeles, and have a new album out, The Bad Beginning. To check their album out on CDBaby go here.